John was educated at Magdalen College Choir School; Oxford; at St. Bees School, Cambridge; at the Middlesex Hospital Medical School - entering in in 1909 for his medical course when just over 16 years old; and the London University O.T.C. - leaving to take a commission in the Territorials, and became 2nd Lieutenant in the Royal Welch Fusiliers. At the outbreak of war, John left his medical studies and served with his battalion being promoted to Captain. Returning to his studies he qualified L.M.S.S.A., M.R.C.S. in 1916, and gained a commission within the R.A.M.C. He eventually returned to his old regiment, who were serving in the Egyptian Expeditionary Force. At the first Battle of Gaza, John was awarded the Military Cross, when "He showed the greatest courage and still in collecting wounded men of all regiments, and in dressing them under continuous shellfire." A few months later he was killed at Tel-el-Khuweilfch, Palestine. He was posthumously awarded the Victoria Cross "For most conspicuous bravery displayed in action until he was killed. Capt. Russell repeatedly went out to attend the wounded under murderous fire from snipers and machine guns, and, in many cases where no other means were at hand, carried them in himself although almost exhausted. He showed the highest possible degree of valour." 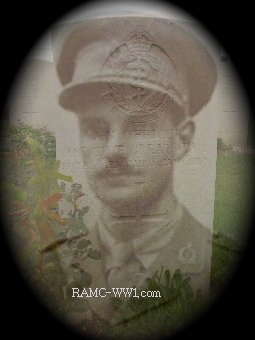 John was the eldest son of William Fox Russell and Ethel Maria Fox Russell of 5 Victoria Terrace, Holyhead; and the husband of Alma Tyler of Court Royal Tunbridge Wells - married in September 1916.